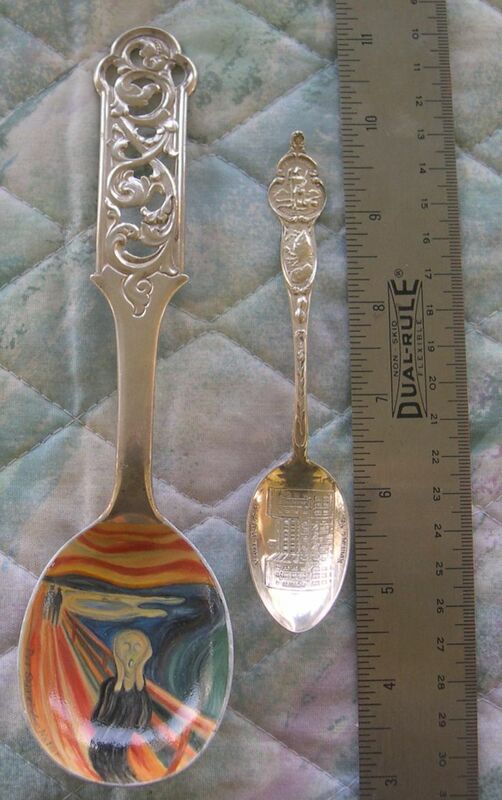 This is a very unusual spoon featuring a painted version of the infamous painting known in the USA as "The Scream" by the expressionist artist Edvard Munch of Norway. Munch made four versions of the Scream between 1893 and 1910 which he titled "Der Schrei der Natur" (The nature of the Scream). One of these pastels was sold for over 119 million dollars by Sotheby Auctioneers in 2012. Beautiful large Norwegian silver spoon with a bowl entitled "Der Schrei der Natur"
The ruler and tea sized spoon are to show relative size. The white streak is a light reflection.